Solidago, known as goldenrods, represents around 100 to 120 different species. You can find it on almost every continent as a common weed. You’ll find it open prairies, savannas, and roadsides. You’ll generally find goldenrod ranging from about 1 to 5 feet in height. Leaves are generally lance shaped and alternate. The flowers occur in panicles at the end of the stem and erupt in bright yellow flowers that are a pollinator’s dream. You will generally see them flowering in the late summer from July through September. The species will vary slightly but are pretty easy to detect. For more information on identifying different species you can visit goldenrod on the USDA Plant Database. Goldenrod has often gotten a bad rap over the years for being the culprit of many itchy eyes and runny noses. However, while the real culprit is a fellow Asteraceae family member called ragweed, goldenrod is actually an ally to battle those same symptoms for which it is being blamed. Goldenrod has a great affinity for the upper respiratory tract and the kidneys or urinary tract. Traditionally goldenrod has been used in cases of itchy, watery burning eyes with an itchy, drippy nose that often arise with allergies, including those to cats. It does seem to have a general affinity for the upper respiratory tract where it helps alleviate infections and inflammation that bring about drippy mucous that comes from the tired out tissues that just can’t hold their fluid. The other area where goldenrod shines is in the urinary tract. This showy plant seems to have a love for the kidney and helps this organ from getting bogged down with bacterial and immune by-products that build up after an infection (think of it as the snot of the urinary system). It can also help during the early stages of bladder or urinary tract infections by helping the kidneys stay flushed of bacteria and tone the mucous membranes to prevent infection from getting deeper in the tissue. Goldenrod helps thin the mucus and fluid for passage while astringing the tissues to allay further pathogenic invasion. Magic! Solidago is a genus of plants that can be found across the world with different species all used for very similar actions but each one filling a particular niche. The european variety S. virgaurea was used topically as a wound medicine since its astringent quality helps close the lips of a wound and prevent infection. The herb was commonly employed in diseases of the lower urinary tract including infections, inflammations and urinary or kidney calculi. The Europeans also took advantage of its astringent qualities internally and used goldenrod in cases of diarrhea, cough, chronic catarrh of the lungs, spitting of blood from the lungs, and gum ulcerations. The North American versions, S. canadensis and S. odora, had similar uses but also some more specific. S. canadensis has been employed for the general cases of flu, cough, respiratory problems such as asthma, or poor urine production leading to “dark and turbid” urine. Its astringent qualities were also utilized for various ulcers and bleeding from the lungs or mouth. It was also used topically for sprains and strains with edema. S. odora had many of the same uses but the Cherokee used this sweeter smelling version for flatulence, colic, fevers, flu, tuberculosis, amenorrhea and neuralgia. The tea of sweet goldenrod is fairly pleasant so it was often combined with less amiable herbs or was taken alone as a digestive stimulant. Externally it was also used by native americans for open wounds, rheumatism, headaches and neuralgia. The root was also used topically for burns and is a much more powerful diuretic than the upper part of the plant. Many of the goldenrod species can be used interchangeably based on what is available in your immediate area. No matter where you go in the world where this showy plant has made itself a resident weed. It finds itself a hallmark remedy for use in the upper respiratory system and in the urinary system with a particular fondness for the kidney. This raging weed has been blamed for so many red, puffy, itchy eyes and sniffly noses it has been shunned by the very folks that need it. It is a useful remedy in the summer when it blooms right alongside its cousin ragweed. It is an ally for those suffering the effects of that noxious illness we call allergies, particularly those of a damp nature. Matthew Wood also mentions that those suffering similar afflictions when in the presence of cats may also benefit. Goldenrod goes far beyond allergies for helping out the respiratory system. It is employed in chronic or acute bronchitis in which there is excessive mucus in the upper portion of the lungs and respiratory system. It is particularly indicated in cases in which blood may be coming up from the lungs during expectoration due to hemorrhage or ulcers in the lungs. The astringent qualities of this herb allow it to have a tonic quality on the mucous membranes for both the respiratory system and the urinary system discussed later. This quality also makes it useful topically for similar symptoms including wounds, ulcers and hemorrhoids. David Hoffman also mentions the use of goldenrod as a gargle for laryngitis and pharyngitis to decrease inflammation and get one’s voice back. The other great affinity for this organism appears to be in the kidney. Matthew Wood uses this herb for tired kidneys that can no longer “pull in the blood.” In general he mentions this fatigue may be found in a generally tired person who is constantly moving from one sitting point to another. This is understandable considering the important role that the kidneys play. The role the kidneys are most notorious for is the removal of metabolic wastes, environmental toxins and drug by-products from the blood. You can imagine that our daily toxic load keeps the kidneys busy. It works particularly hard after an illness where the immune system and drug by-products are bogging down the system adding a little extra work for the kidneys. This may explain some of that lower achy back just below the lungs someone might experience after an illness. Taking goldenrod along with a lot of water can help flush these products through the kidneys and improve the general flow of fluids. The herb can also be employed utilizing its diuretic quality in early stages of a urinary tract infection or urinary gravel where more moisture is needed to flush out the culprits. The urine for these individuals is general dark, odorous and scanty which shows a general lack of fluid to excrete body wastes. The other use for goldenrod is as a general digestive aid that can help with flatulence, stomach pain or spasms and diarrhea. S. odora appears to have a greater affinity to the digestive tract as it is most often the herb implied throughout historical texts. While any of the goldenrods could be employed here it’s aromatic odor may give a hint to its more carminative effects from volatile oils. Goldenrod in general (but S. odora particularly) has a relatively pleasant taste that was historically used to cover up the tastes of less-than-pleasant herbs being used in a formula. Due to goldenrods ability to help clear the excess waste from the body it serves that it would be a great remedy to use towards the end of many illnesses to help clear the body and allow for more efficient repair and restoration to a tired system. Goldenrod isn’t one of the more common herbal medicines found in commerce so is lacking in the research department. It can be spotted here and there in a few in vitro studies comparing the antibacterial or anti-inflammatory action to that of standard medications or other herbs. Since many herbs pose anti-inflammatory action in vitro it plays little relevance in our clinical setting. Out of Turkey we have an interesting study conducted on Solidago in which the antioxidant value of various preparations were compared based on the constituents that were extracted. Six different preparations were included: three tinctures (40%, 70% and 96%), an infusion, a decoction and a maceration with the latter three all just using distilled water. The authors concluded that the maximum free radical scavenging activity was greatest in a standard infusion (Apati et. al., 2003). In other words, drink your tea! For small animal: Standard infusion of dried flowers; ¼-½ cup per 10lbs given up to three times daily. 0.5-1.5ml tincture (1:2) given up to three times daily. Safety in pregnancy is unknown. Because high water intake is recommended with goldenrod and diuretic effect, patients with impaired kidney or liver should be carefully monitored. Caution in people with allergies to Asteraceae family. Lindsey is an Iowa native with a passion for helping individuals navigate the ever-growing field of wellness and preventative care for both themselves and their canine companions. 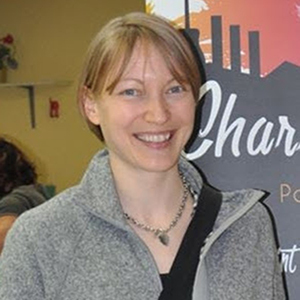 She has completed her Master of Science from the Maryland University of Integrative Health and continues to expand her knowledge and practice at the Eclectic School of Herbal Medicine. You’ll generally find her wandering through the woods with her four-legged companion attempting to ID every plant along the way, attending the local theatre or in the apothecary measuring and mixing new herbal blends for her practice, Prairie Rose Herbals (www.prairieroseherbals.com). Apati, P., Szentmihályi, K., Kristo, S. T., Papp, I., Vinkler, P., Szoke, E., & Kery, A. (2003). Herbal remedies of Solidago—correlation of phytochemical characteristics and antioxidative properties. Journal of Pharmaceutical and Biomedical Analysis, 32(4), 1045-1053. Chevalier, Marlène, Etienne Medioni, and Isabelle Prêcheur. "Inhibition of Candida albicans yeast–hyphal transition and biofilm formation by Solidago virgaurea water extracts." Journal of medical microbiology 61.7 (2012): 1016-1022. Demir, H., Açik, L., Bali, E. B., Koç, L. Y., & Kaynak, G. (2009). Antioxidant and antimicrobial activities of Solidago virgaurea extracts. African Journal of Biotechnology, 8(2). Holmes, P. (1998). The energetics of western herbs: Treatment strategies integrating western and oriental herbal medicine, 2nd ed. Boulder, CO: Snow Lotus Press. Hoffmann, D. (2003). Medical Herbalism: The Science and Practice of Herbal Medicine. Inner Traditions / Bear & Co.
Kołodziej, B., Kowalski, R., & Kędzia, B. (2011). Antibacterial and antimutagenic activity of extracts aboveground parts of three Solidago species: Solidago virgaurea L., Solidago canadensis L. and Solidago gigantea Ait. Journal of Medicinal Plants Research, 5(31), 6770-6779. McGardner, Z. & M. McGuffin. (2013). AHPA’s Botanical Safety Handbook, 2nd ed. American Herbal Product Association. CRC Press: New York. Wood, M. (1997). The Book of Herbal Wisdom. Berkeley, CA: North Atlantic Books. Wood, M. (2008). The Earthwise Herbal: Complete Guide to Old World Medicinal Plants. Berkeley, CA: North Atlantic Books. Wynne, S. & Fougere, B. (2007). Veterinary Herbal Medicine. Mosby Elsevier: St. Louis, MO.